Welcome to AgapePinson.com, the website of Agape Baptist Church. We are a gospel community of faith in Pinson, AL. We are glad you took the time to visit our site and hope you consider joining us in worship God together. It is probably the one word that has been used the most to describe Agape over the years, that when you come here it feels like family, it feels like – ‘Home’. Indeed Agape is a body of believers made up of caring individuals who want to see you growing and moving closer to God with each and every passing day. It is a family that lifts each other up and sticks together through not only joyous celebrations but also tough disappointments. Over and over this family has shown that the Love of Christ is not just an ideal we preach about but a reality that we try to live out together. Agape desires to be a body of believers that God uses for His purposes. We want to be a part of His plans to reveal His glory to our city, county, state, nation and even our world. We want to help people discover and live into the truth that God gave us – His only Son, Jesus Christ, not just to forgive us of our past mistakes, but so that He could help us to live a life that makes an IMPACT on people for all of eternity. 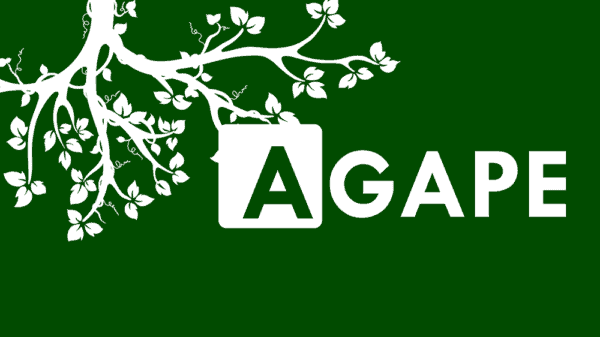 Whether you are looking for help in getting through rough times in your life, looking for a safe place to try and learn more about who God is and what He expects, or whether you are a long time Christian looking for a place to be apart of God’s work in this community – we invite you to learn more about Agape. Throughout this website you can get an overview, just a sampling, of who we are, what we do and what we feel our purpose is all about. You can contact one of our pastors for prayer or counseling, or one of our ministry leaders for more information on how you can be a part of what God is doing in and through Agape. But, the best way to learn more about this family is to come and visit us. Don’t worry about dress code, we don’t, just come as you are and let us say it again… Welcome Home!